Does anyone else here enjoy RC toys like quadcopters? Topic: Does anyone else here enjoy RC toys like quadcopters? Re: Does anyone else here enjoy RC toys like quadcopters? I'm not sure. I recently upgraded to some heavy duty Tamiya ones, but then the ESC died before I got a chance to try them out. In the old days...Hey. We used to fly our planes with strings attached. My grandparents lived on a culdesac so we took my brand new fighter plane out for a run. Well that didn't last long. After a half hour trying to get the motor started we were set for take off. I am reminded of the theme from "The magnificent men in their flying machines" a movie from the 70's. "They go uppity up up, They go down de down down. Never to fly again. My dad likes flying these tiny remote helicopters sometimes. It's cool to watch. My friend Ari has a two car garage full of RC planes. A good guess is around fifteen. or several thousand dollars worth. He hasn't let me fly one yet but I only get to Vegas every so often. I did watch him for two hours slathered in SPF 30 in 90 degree heat. Not bad for November. My plane on a string only lasted it's maiden flight. I didn't know they could fly 90 degrees. I do now. I love RC! I haven't been able to fly for the past 2 years because for my vision. I'm getting a new pair of glasses soon. FPV, NSRCA, and CPA (low, fast and loud)! I'm just getting into the hobby but mainly for surf fishing. I just bought a sjrc s20w drone to take my bait past the surf, would love to catch a tuna or a nice size halibut. That sounds really cool actually! Drone fishing These things are fun to fly as well. This drone is a blast and it turns out I'm getting it for free. Ordered it through Wish.com and it was a little on the small side, so they are refunding me the purchase price and I get to keep the drone. Using the refund to get a DJI Phantom 3 standard and I will use it for more than just surf fishing now. Sweet on the free drone! These things are so fun to fly. 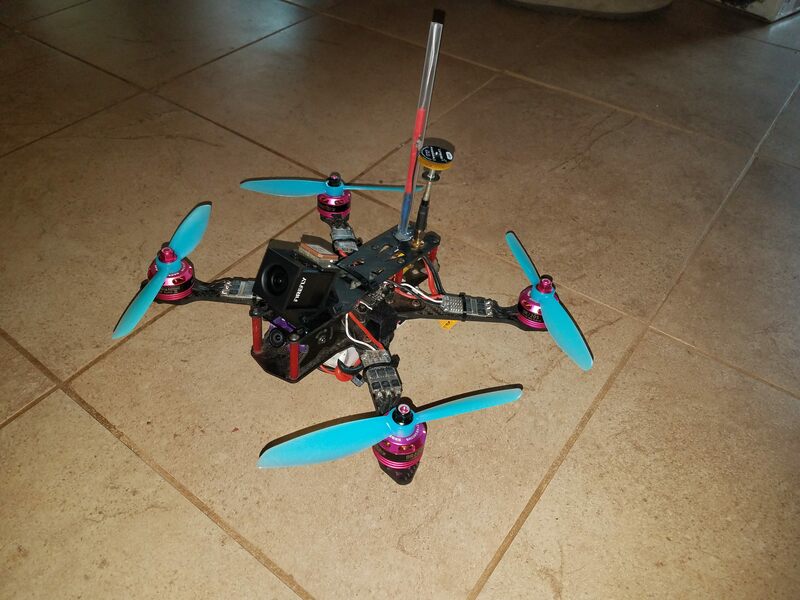 I built a 6" long range quad while I was out on recovery leave using a bunch of spare parts. Just had to buy a little GPS unit, which was only $8...so now it has GPS as well.